A herniated nucleus pulposus is a more technically correct term that means the same thing as a “herniated disc.” The term is simply a more descriptive way to explain what happens to the disc when it herniates. A herniated nucleus pulposus occurs when the soft central nucleus pulposus portion of the disc slips out or escapes from the disc when an opening or weakness develops in the dense outer portion of the disc. In the average human spine there are 23 spinal discs. Each disc has a jelly-like central portion (nucleus pulposus), that is found behind and near the middle of the thick, tough and fibrous ring of layers of the outer disc material (annulus fibrosus). The disc looks a lot like a cross between a hockey puck made of layers of outer fibrous strands of tissue, and a jelly doughnut that has a blob of semi-liquid gel in the middle. The fibrous ring and inner nucleus pulposus work together to provide support, distribution of compression forces and flexibility to each disc level, along the entire length of the spine. A spinal disc can herniate in all levels or sections of the spine, although the most common is the low back (lumbar spine) 90% of disc herniations occur in the lumbar spine. Less commonly it is found in the neck (cervical spine) where about 8-10% of disc herniations occur. Rarely is it found in the mid back (thoracic spine) where about 1-2% of all disc herniations happen. Men in general are more prone to herniation of the discs, and especially those men 50 years and more. Weakness and tears of the disc are primarily seen toward the back and sides (posterolateral direction) of the disc because the thick posterior longitudinal ligament lines the spinal canal. This additional layer of fibrous tissue reinforces the disc in this area and prevents true posterior or directly backward disc protrusion. In addition to the classic explanation of nerve irritation being caused by direct or indirect physical compression and stretching, often referred to as a pinched nerve, there is another chemical factor that gives rise to back pain and other disc herniation symptoms. This chemical cause is called tumor necrosis factor-alpha (TNF), that leads to irritation leading to tissue inflammation. This chemical trigger is not only released by the herniated nucleus pulposus, but also by the damaged or torn disc annulus fibrosus material, the facet joints, and any soft tissue elements involved in spinal stenosis. TFN can not only cause pain and inflammation, it is suspected to be a key contributor to the process of disc degeneration. No part of a spinal disc has a nerve supply. If the disc is unduly compressed, torn or worn away with age no pain is felt because of the absence of a nerve supply to this tissue. Since each disc is without a nerve supply of its own, many people have one or more herniated discs at various levels of their spine but are not aware of it until the condition advances far enough to cause nerve compression or TFN chemical irritation. Any pain that might be felt when a disc herniates will only occur because of stretching or compression that is applied to the spinal nerves and spinal cord, as a result of problems caused by the herniated nucleus pulposus. 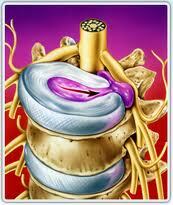 In addition there is a very limited and easily disrupted blood supply to the spinal discs. 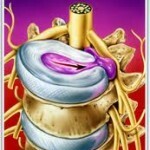 This poor vascular supply makes it impossible for the body to heal and repair the disc tissue. By far the most common way for a disc herniation to occur is from the effects of slow and gradual deterioration that are part of the natural aging process. As a person ages, meaning from the early 30s and upward, the spinal discs will develop small tears and thinned areas that weaken the wall of the disc. Over time as the weakness worsens the nucleus pulposus will eventually push through the weakest part of the disc wall. Eventually the nucleus pulposus will extend out past the confines of the disc to apply pressure and chemically irritate with TFN the delicate nerve tissue of the spinal canal. When this painful situation occurs it is termed a herniated nucleus pulposus. It is important to determine the cause of spinal symptoms that are suspected to be due to a herniated nucleus pulposus. Part of that process is to confirm or rule out other potential problems that might actually be the cause of the presenting complaints. Spinal problems such as arthritis, spondylolisthesis, spinal stenosis, facet syndrome, degeneration, tumors, metastases and space-occupying lesions, must also be considered and either ruled in or ruled out, since they can mimic the symptoms of a herniated disc. Physical examination of the area of involvement including measurements, posture and alignment, reflex tests, muscle strength, orthopedic tests, etc. The primary treatment of a herniated nucleus pulposus is a short period of rest lasting no more than a few days. During this time treatment also should include using ice packs over the area of pain, and taking just enough anti-inflammatory medication to reduce pain so sleep is not disturbed. Within a week or two light exercise, physical therapy and/or spinal manipulation provided by a chiropractor skilled in disc herniation treatment should be used until all complaints are eliminated. Patients whose occupations habitually stress the spine (truck drivers, construction workers, etc.) are often advised to change job activities to avoid recurrent back injury or at least undergo a permanent low back exercise and rehabilitation program in an effort to avoid future disc deterioration. Those patients who follow such a conservative treatment plan recover within 2-4 months and return to their normal activities. A small number of people need to have further treatment, which may include steroid injections or surgery. Often the results of spinal surgery are not justified by the short term relief and exacerbation of the spinal pain due to structural weakness that can result.